Also included: a 14½" x 19½" full-color foldout Planning Map with a regional map of Germany, Austria, and Switzerland, plus handy close-ups (with major sights) on the back: Berlin, Munich, Salzburg, and Vienna. (Note: This is a slightly smaller version of Rick's stand-alone Germany, Austria & Switzerland Planning Map). What's the difference between this Germany book and Rick's Best of Germany guidebook? 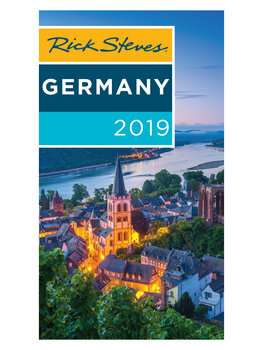 The shorter Rick Steves Best of Germany guidebook focuses on Germany's top destinations and sights, is in full color, and is updated every other year. Should I get Rick's Berlin guidebook in addition to this Germany guidebook? If you're spending only a few days in Berlin, Rick Steves Germany is all you're likely to need. If, however, you're spending four days or more in Berlin, the extra information in Rick Steves Berlin can be worthwhile. It offers more in-depth sightseeing information, several additional self-guided city walks and museum/sight tours, and more specifics on shopping and entertainment. Other information is generally the same — the Berlin chapter of Rick Steves Germany has nearly all the hotels, restaurants, and nitty-gritty practical advice for Berlin and its day trips that you'll find in the Rick Steves Berlin guidebook. Should I get Rick's Munich Pocket guide in addition to this Germany guidebook? Nope! The Munich and Salzburg chapters of the the Germany guidebook already include all the information that's in Rick Steves Pocket Munich & Salzburg — and then some. No, because the Snapshot guide for Rothenburg, the Rhine, and nearby areas is simply several excerpted chapters taken directly from the complete Rick Steves Germany guidebook.